Daily Mail has an article with some great pictures from this year’s Il Palio, the famous 400-year old horse race that occurs every summer in Siena, Italy. I was there in July 2001 and I remember waiting all day in the Piazza del Campo for the race to start. I sweated like a pig under the relentless Italian sun. We survived on pizza slices and water bottles with frozen cores that we purchased with real Italian lira (this was the summer before euro banknotes were introduced) from a vendor with an ancient cart. As the afternoon wore on the piazza filled with fans from all the Contrada. We watched countless parades of armored horsemen and then the revered racehorse from each Contrada. During the race, I remember one horse suffered a career-ending injury and its Contrada raged with grief as only Italians can do. We learned later they would have to put the horse down. Some men violently ripped cameras from tourists who had snapped pictures of their doomed horse. The cameras had invaded their sorrow, and the outraged Contrada shouted encouragement to the camera thieves. Later, I was thrown aside by two burly men who busily plowed a path through a medieval alley for their winning horse. They were followed by a platoon of women garbed in the colors of their Contrada. 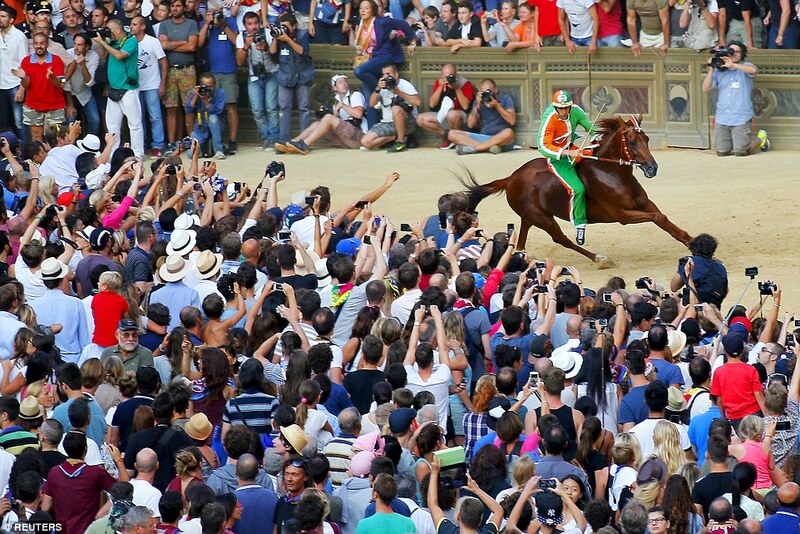 Looking back now, medieval Siena’s ancient Il Palio seemed like a barbaric rite from Games of Thrones, with its violence, blood, passion and death. Even now I can’t stop looking at it.